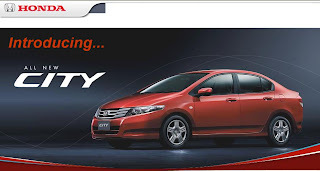 Honda has planned to launch the new city in late November 08 and it is likely to be a global launch simultaneously with Thailand, the mother country for the city. It will be more expensive than the outgoing model. We expect Honda to price the city from around Rs 8 lakh. There could be a fully loaded version in the Rs 10 lakh bracket.It will have 15 inch wheels to increase ground clearance, direct and communicative power steering inspite of EPS. A paddle-shift option will also will available in CVT model.